Cloth Diaper Revival: Baby Jogger Boot Camp: 10 days to go! Baby Jogger Boot Camp: 10 days to go! EEK! There are only 10 days until my 5k! Why don't I feel ready? I'm beginning to think I will never feel ready. I'm just going to have to jump in that morning and hope for the best! Of course, it's relieving to know that I'm not doing it for a race. I don't care about my time. Although, it would be pretty embarrassing to be last. Reminds me of elementary school when I was so tiny that I was slower than all the other kids. My husband almost had to bail on me for the 5k too! He is supposed to go to a meeting that Saturday morning. Thankfully, he was able to get out of it. There is no way I could do this alone! He is my biggest cheerleader and I need his help! I will say that there has been a shift in my feelings toward running. Remember this post where I wondered when I would reach the point of loving running over hating it? Well, now I don't hate running. I don't love it either, but the idea of going for a run isn't nearly as daunting to me. Of course, don't ask me how I feel about running while I'm in the middle of it! I'm confident my answer would not be the same. I was checking out the route for my upcoming 5k. It looks like there are a few hills along the way. Running uphill will not be fun, but I love the momentum I get (and ease) of running downhill. I will definitely be utilizing the hand brake feature of the Summit X3 if needed and the wrist strap will definitely be a must! There is a hand-controlled rear drum brake that is perfect for running on hills. 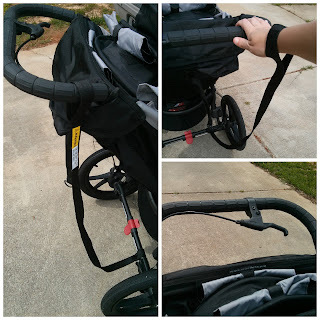 The wrist strap prevents the stroller from completely getting away from you while running one handed. And then of course, there's the rear brake. I'll be spending the weekend doing some DIY projects at home and doing everything in my power to hope I'm not too exhausted to train! 10 days to go! Love Baby jogger! Thanks for sharing your thoughts!!! How exciting! It's getting close and what a nice stroller to use for it! I used to run and loved it! I should get our jogging stroller out and get started again! Best of luck to you in your 5k! I have never used a Baby Jogger but my jogger has similar features and yes, they are very helpful in keeping control of your stroller. Good luck with your 5k - they're fun! We bought a jogger a couple of months ago, with the intention of me starting running again...but I just found out that I'm pregnant (won't be starting a new running regimen after all!)! A stroller that needs break? Ack! Definitely not for me!